It’s not unusual for businesses to fall into the trap of sticking with their same welding gas suppliers year after year. Unfortunately, this isn’t always because they are happy with their suppliers. It’s often the case that it’s just easier to stay with a supplier you know than to undertake the research and effort required to change welding gas suppliers. We totally understand that sometimes keeping business operations as is, is the way to go, but if you’re at all unhappy with your supplier, we invite you to take a closer look at Josef Gas. We guarantee you won’t experience better service anywhere! We provide cylinders before you need them. You’ll receive all the necessary cylinders and cage(s) delivered on the first delivery rent FREE for up to one month. Once you’ve received your cylinders from us, then you should call your current supplier and let them know that you have already changed suppliers. Ask your former supplier to remove you from any regular scheduled delivery route(s) immediately to avoid paying for cylinders you no longer need. Retain your former suppliers’ cylinders until they are empty. Once they are empty, arrange to have them picked up by your old supplier. Keep them until all of the cylinders are empty or return them as you empty them, depending on how long it takes you to empty cylinders and what your on-site storage capabilities are like. Don’t expect to receive any credit for returned cylinders that still have gas in them. That is not common industry practice; so you may as well keep your old cylinders and use the gas you’ll be paying for or have already paid for. If you contact the old supplier before you receive cylinders from Josef Gas you run the risk of them choosing to pick up the cylinders early – sometimes before you’ve received cylinders from us. If this will cause problems with your workflow, don’t contact your old supplier until you’ve received cylinders from us on-site. Keep in mind that the cylinders don’t belong to you. They are the property of the gas supplier. If they choose to pick them up early, you could be out of gas. Ensuring you have the gas you need when you need it, is one reason why we provide our cylinders and cages rent-free for up to one month. That way, you have the gas you need but aren’t paying double for it. We are always willing to help our customers to make the transition easier. “At your service” isn’t just lip service at Josef Gas – we really mean it! Anything you need, any questions you have, contact us and we will do our best to come up with a plan that works for you. You are not obligated to continue working with your current supplier, unless you have a signed agreement with them. We pride ourselves on delivering a simple and seamless changeover experience. 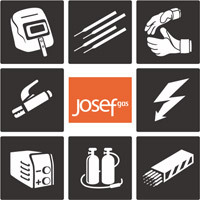 If you’ve been thinking about changing welding gas suppliers but weren’t sure where to start, call Josef Gas at 416-658-1212 or email us at info@josefgases.com to learn more about our services, the gases we supply, and our process. We are a hands-on, family-owned and operated supplier with over 70 years of experience in the welding and gas industries.